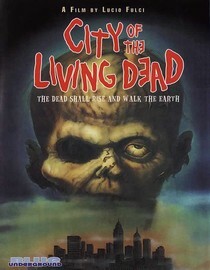 Although I've been aware of him for a while, this is the first time I've ever watched one of Lucio Fulci's movies. I'd actually hoped to watch Zombie instead, but Netflix's shipping dates may make that impossible. We'll see. From what I'd heard of Fulci, and his penchant for extreme gore, I knew that I'd probably need to brace myself for this one. Maybe I was over prepared, because it wasn't as grisly as I'd feared. That's not to say that there weren't some pretty shocking scenes. Fulci's zombies are much more gruesome looking than your standard undead, and their kills are brutal. There's an effect several times in the movie where one of the characters cries tears of blood - it's really unsettling. Also, a dad protects his daughter's honor by killing a guy with a table drill through the head, the first scene so far this month that I've had to watch from between my fingers. When you watch a Romero zombie movie, you never get an explanation for why the dead are rising. In movies where you do get an explanation, it usually is either some kind of virus (28 Days Later) or some sort of chemical reaction (The Return of the Living Dead). I think this is the first movie I've seen that had a supernatural explanation for it. The first scene is of a priest hanging himself in a churchyard, which opens a gate to Hell and causes the dead to begin rising. If the gate isn't closed before All Saints Day, it will remain open forever. A psychic and a reporter race to the town of Dunwich (a nice shout-out to H.P. Lovecraft) to try and stop the onslaught of the dead. I'm impressed with Fulci. The script wasn't great and the actors seemed like skilled amateurs, but the guy knows how to gross you out. If Zombie gets here in time to be included in my zombie block, I may still go ahead and review it. I give this one four maggots out of five.